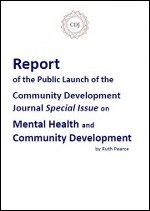 2012 saw the publication of the Community Development Journal’s first ever Special Issue on Mental Health and Community Development (Volume 47, Issue 4). A widely advertised and free launch event was held in London on 7 December 2013 to celebrate this publication and explore some of the key themes in the issue. From this page you can download a report from the event and powerpoint slides from a number of the presentations. Mental health and community development – deepening the relationship…. ?